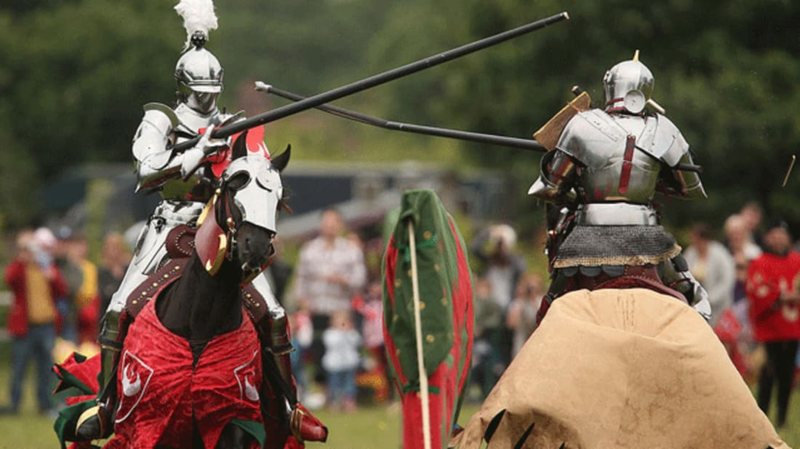 For nearly 1000 years, jousting tournaments have attracted some of the most elite men in England to compete one-on-one. Now the BBC reports that female knights will be free to participate in the sport at British castles for the first time this summer. Jousting originated in the Middle Ages as a way for knights to show off their combat and horsemanship skills in mock battles. Tournaments had largely faded away by the mid-17th century, but the tradition has since been revived for tourists to enjoy at castles across Britain. These games have stayed true to tradition by featuring exclusively male competitors, but now Bolsover, Kenilworth, Pendennis, and Carisbrooke castles have all opened the event up to lady knights. Emily Sewell, the head of events for English Heritage, told the BBC that the decision was made so that visitors would have the chance to see the "most accomplished knights on the circuit." Knights competing this summer thanks to the new announcement include Alix van Zijl and Nicky Willis. Willis, who will be jousting at Pendennis and Kenilworth, told the BBC, "Kenilworth is famed for some of the most elaborate tournaments in medieval England–as well as playing host to one of England's strongest women, Queen Elizabeth I–so it's the perfect place to sort the women from the boys." Kenilworth Castle’s next "Grand Medieval Joust" will take place this weekend.